Tractors, slides, digging in sand and of course dinosaurs. In other words, Dinosaur World in Somerville is a preschooler's heaven. We went back in time today to a time when giant creatures ruled the earth. A prehistoric time brought forward to the current day. Today we went to Dinosaur World. A pram friendly track led us around dinosaur after dinosaur. This animatronic creatures moved and roared; be aware of this if your child is sensitive to loud noises. Trill seeking Miss and Mr 3 absolutely loved these prehistoric beasts. I paid an additional $8 per child to do a fossil hunt; a large sand pit that children dig into to find their own rock. Then using the tools provided, they cracked it open to reveal their very own dinosaur fossil to take home. The activity probably took around 15 minutes from start to finish, which I thought was worthwhile for any young wannabe paleontologist. Make sure to keep your eyes peeled for staff carrying baby dinosaurs. We spotted Lollipop the baby triceratops who was extremely friendly and enjoyed the attention of visiting children. We then spent time playing in the sand pit and play area. We had taken our own food and there where plenty of tables. BBQs are also available for free use should you wish to BYO meats. You can also buy snacks and drinks on site from a small kiosk but be aware this is cash only; no card. We finished off with a tractor ride (included in admission price) around the Christmas tree fields. We even spotted a mischievous (real) rabbit, who Mr 3 named Peter. We probably spent around 2 hours at Dinosaur World, which included the tractor ride, fossil dig and a good play. I would say that Dinosaur World is tailored towards younger children, under 8 years of age. 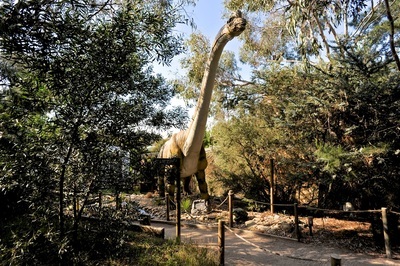 Small Ideas members save 15% off the admission price for Dinosaur World.